After stopping to photograph the heirloom tomatoes for posterity, I threw this quick pasta together for lunch in under 10 minutes. 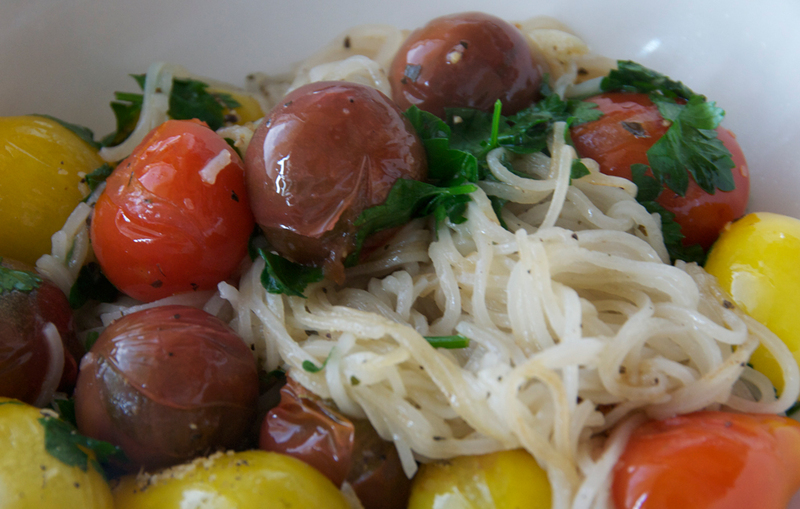 Take 1 serving thin angel hair-style rice noodles, place in a medium pot. Add cold water until half full, place on burner on High. Cook according to package directions (approx. 3 mins.) drain. While you’re waiting for the pasta to cook, slice 1 clove garlic super thin and chop 1 handful parsley. Rinse a double handful tomatoes. When pasta is done, add it to the pan, salt & pepper to taste and add a shot of olive oil if the mixture looks dry. Add parsley and a pinch red pepper flakes. Toss to combine and serve.